Professors Elaine Fahey and Nigel Duncan were members of City’s Strategic South East Asia delegation, which includes Hong Kong, Singapore and Malaysia. The City Law School played a leading role as part of a City, University of London delegation to Malaysia in early May 2018. In addition to its presence at the British Council’s ‘Going Global’ Conference in Kuala Lumpur, the Law School, and City’s President Professor Sir Paul Curran, co-hosted a dinner with the Inns of Court Malaysia (ICM) in Kuala Lumpur, after hosting an alumni reception. Attendees included retired Chief Justice of Malaysia, President of ICM, Rt. Hon. Tun Arifin Bin Zakaria; Chief Justice of Malaysia, Rt. Hon. Tun Md Raus Bin Sharif; Attorney General of Malaysia, The Hon. Tan Sri Dato' Sri Haji Mohamed Apandi Bin Ali; Hon. Secretary of ICM Mary-Ann Ooi Suan Kim, Barrister, Advocate & Solicitor (City Law School BPTC Alumna), and many other distinguished members of the judiciary and Executive Committee of ICM. The alumni reception and ICM dinner was organised with the significant support of Mary-Ann Ooi Suan Kim. Other attendees included the Vice-Chancellor of KDU University College, Professor Hiew Pang Leang. After an address from Professor Sir Paul Curran, the City Law School’s Professor of Legal Education, Professor Nigel Duncan, gave a lecture on the ‘Future of Legal Education’ and took questions from the ICM. The City Law School’s Associate Dean (International), Professor Elaine Fahey and Professor Duncan also met the Dean and various faculty of the University of Malaya Law School, where they discussed student mobility, clinical legal education and possible areas of collaboration. 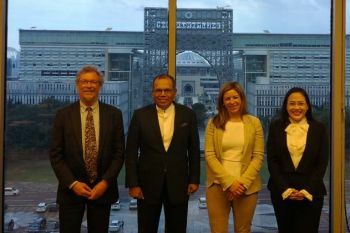 They met with the director of the Asia-Europe Institute at the University of Malaya and with faculty of Multimedia University Law School (Cyberjaya campus), following their recent visit to the City Law School. Professors Fahey and Duncan also travelled with Mary-Ann Ooi Suan Kim to the Palace of Justice at Putrajaya to be received by the Chief Justice in his chambers and discussed future ICM-City Law School collaborations, including judicial training and CPD. 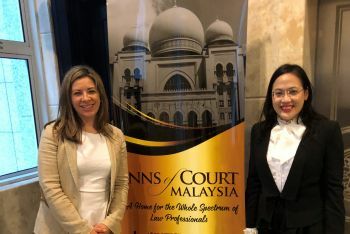 The City Law School journeyed to Malaysia as part of City’s Strategic South East Asia delegation, which includes Hong Kong, Singapore and Malaysia.